Beat this sky, if you can!! One of the best of countless fabulous sunsets in La Manzanilla. 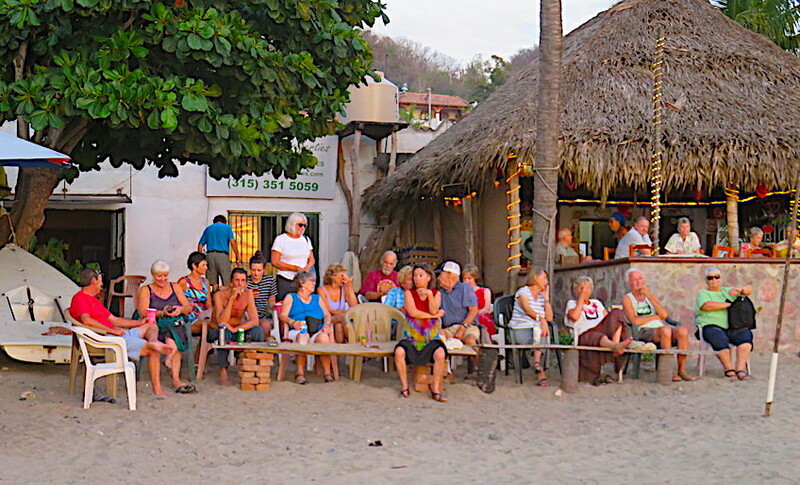 Sunset Rating Society of La Manzanilla, Beach Bar Chapter. This entry was posted in Beach, Beach Photos, La Manzanilla, photos of beach, Sunsets, The Beach, Uncategorized and tagged Beach Sunset, IMAGES OF LA MANZANILLA, photos of sunsets, sunset image, sunset photos on February 11, 2018 by lifelessons. The constant undulation and the murmur of the waves. at the edges of the world that ensconced our busy lives. It craved us as its audience. It pulled us to its shore. It calmed our petty grievances with its might roar. sweeping us away as its anger came unfurled. At other times it lapped at us, assuaging all our pain. That’s why we returned to it, over and again. uncovering the secrets so long within its keep. to examine as we walked along the morning-evened sands. for denizens of dry worlds to collect on bended knee. the music of the waves may be our funeral knell. The prompt today is undulate. This entry was posted in Beach, beach poems, Ocean, The Beach, Uncategorized and tagged Beach, Beach photos, Daily Post, Daily Prompt, Ocean, ocean images, poem about beaches, poem about the ocean, trash on January 10, 2018 by lifelessons. The challenge was to take photos of the backs of things. Some of these are way too small in this collage. Click on the first photo to enlarge them all and see captions. Behind the Family behind the Surf. This entry was posted in Beach, Beach Photos, Cee's Fun Photo Challenge, Challenges, Photo Challenges, photos of beach, The Beach, Uncategorized and tagged Beach photos, beach scenes, behind, Cees Fun Foto Challenge, photos of dogs, photos taken from behind, rear shots on March 28, 2017 by lifelessons. the fishermen have gone away. to swoop over and sit upon. The beach is empty when fish are gone. milled on the beach the whole day long. or school or kitchen—the whole mob. No beer-swiggers or docile dopers. from the grasp of an ambitious wave. Once more, the beach is just itself. just outside my beachside door. no sandcastles along the shore. extending far above wave’s reach. No butts or bottles, abandoned sandals. with a stick held in the hand. their teenage love doomed from the start. that overnight swept them away. Every morning, a clean new day. This entry was posted in Beach, beach poems, photos of beach, The Beach, Uncategorized and tagged Beach images, Beach photos, beach poem, Daily Post, Daily Prompt, litter, poem about the beach, rhymed poetry on March 21, 2017 by lifelessons. the small stain of the setting sun, spread by nature’s brush. of that calmer ocean on the horizon’s edge. making us forget for now all that we are not. are flushed into the water to sink into its seams. This is why we gather to watch the sunset’s beauty. every single evening—as though it were a duty. The prompt today was murmuration. This entry was posted in Beach, Beach Photos, beach poems, La Manzanilla, photos of beach, Sunsets, The Beach, Uncategorized and tagged Daily Post, Daily Prompt, Daniel's Sunset Bar, IMAGES OF LA MANZANILLA, images of sunsets, La Manzanilla, murmuration, photos of sunsets, sunset image, sunset photos, Sunsets on March 12, 2017 by lifelessons. Kids and Dogs. A Fine Match!!! Morrie had a wonderful time on the beach yesterday with these three enthusiastic playmates and for once I had two hands free to snap photos. And in case you wonder, no that little girl isn’t holding him by the tail!! These are priceless, so please click on first one so you can see them all enlarged in a slideshow. Some of them made need a few seconds to come into focus. Be patient. These photos are for the WordPress prompt A Good Match. This entry was posted in Beach, Beach Photos, photos of beach, The Beach, Uncategorized and tagged Dogs, dogs and kids at play, dogs at play, Kids, Morrie, Morrie images, Things that go togther, Wordpress Weekly Photo Challenge on February 23, 2017 by lifelessons. The front and back of my beach rental open onto two different worlds. One is a world of cars, loud motorcycles, passing vendors with loudspeakers mounted on their trucks and at night, kids collecting to drink beer and blast music, other music from bars, mufflerless motorcycles and laughter. The other opens onto a pristine beach with sea birds, fishermen, dogs, sand, an informal “beach bar” where neighbors gather each night to sip tequila and watch the sunset. Since my beach cottage is essentially two large rooms with wide openings between and sliding glass doors and window that open onto the beach, plus another high double window that opens onto the street and that needs to be left open for ventilation, every morning I awaken to both worlds. And this year, the additional sounds of Morrie who is ready to be let out for morning functions, to be fed and then to be taken off (with tennis ball) for another morning’s adventure. Between his basic functions and the beach walk, however, looms a matter of more importance: THE BLOG!!! Sorry Morrie. One minute more, while I post this! is a symphony of sounds nearby and others out of reach. as I lie here on the couch, sorting out my blog. The day can’t really start for me until I’ve shed my words. until I shake the words out and put them all away. to fill the space where it has been. of nature and of passers-by with which this beach abounds. Yet the bedroom window opens onto a busy street. I hear the passing traffic, the sound of passing feet. all the usual street sounds of a noisy Mexican day. The dog protests more earnestly. He’s ready for our walk. He has no patience for this blog—its ponderings and talk. to wander off in other worlds of wind and surf and sand. The prompt word today was sound. This entry was posted in Beach, Beach Photos, beach poems, photos of beach, The Beach, Uncategorized and tagged Beach, beach scenes, Daily Post, Daily Prompt, Morrie, Morrie images, poem about morning sounds, sounds on February 15, 2017 by lifelessons.